Onshore seafood industry jobs in Alaska are almost entirely processing jobs. While some jobs will be office work and administrative, the majority of jobs onshore naturally lend themselves to processing because of the sheer number and tons of fish that require handling during a season. Processing plants exist in many different sizes and in several different capacities. Some are offshore vessels where the processing takes place while others (and most) are located on docks or piers with close access to ships. Regardless of the place, the specific Alaska fish processing job you have, or the fish you are processing, most of the work is very similar. Processing plants are structured in almost identical ways. There is a main floor where the fish are processed and then later frozen or canned. It is often common for a processing plant to have separate areas where fish eggs are canned and shipped as well. Most plants are large and as a result require a lot of employees. For this reason, most processing plants that hire in large numbers also have sleeping quarters at the plant, or in very close proximity. If sleeping quarters are not provided at the plant, housing or camping areas are often close by and offices, lounge rooms and cafeterias are commonplace at onshore processing plants as well. Depending on the region where you will be working, processing plants can be within a major city or far away from civilization. It is difficult to say where exactly a plant might be located in terms of a city, such as Kenai, Alaska, but you can be sure that the plant will be close to water where there is easy access to fishing boats. Processing jobs are the best chance for green horns (first-timers) to find Alaskan fishing industry employment. The offshore jobs usually pay higher, but processing jobs still represent an excellent chance to earn money during a summer. Summer processors in the Alaskan fishing industry usually make from just over $8.75 an hour to $13. Employees returning to Alaska for a second or third season are paid more because of their experience and dedication to the industry. The possibility of over time and paid bonuses are perhaps where employees make the most money. Overtime pays time and a half, with hourly wages increasing from $13.12 an hour to over $20 an hour! Additionally, many processing employers will pay bonuses after about 300 hours of work, which usually commiserates to about a months worth of work hours. Also, freezer crews and performance bonuses are usually offered $0.30 – $0.50 an hour more, and with so many hours to be worked, the paychecks really add up during the summer. In terms of summer earning potential, let’s just say there is a reason why so many people travel north to work in Alaska and most employees leave with thousands of dollars in their pocket. On occasion, processors can earn more than $5,000 for a summer worked in Alaska. The working conditions for a summer processor in Alaska can be rather routine. 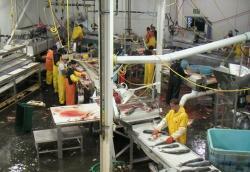 While processors are required to stand for hours at a time processing fish, the type of work tasks vary regularly. It is common for first timers to work some of the less luxurious jobs like sliming, or doing work in an egg house. However, this might be for only a few days a week until the job demand changes and they move to the freezer for a day and then the main processing floor. As you can see, while shifts might involve a mundane task, the tasks change frequently. The best thing to remember as a first-timer is that the people earning more and doing the more sought after jobs had to do the same jobs you are doing, in your first round of processing. The working conditions are not as bad as you might think, and most people leave a season surprised at how much fun they had doing the work. All long shifts offer paid breaks with snacks and lunches often provided. While you might work two shifts in a day, they are broken up by hours in between, where one can watch movies, shower, read or even choose to work another task, in order to boost their paycheck that week. The best thing a new worker can do is to understand the work environment and hours you will be working before starting. Being mentally prepared and understanding the work will help you enjoy your time in Alaska, rather than be surprised at the work schedule or environment.